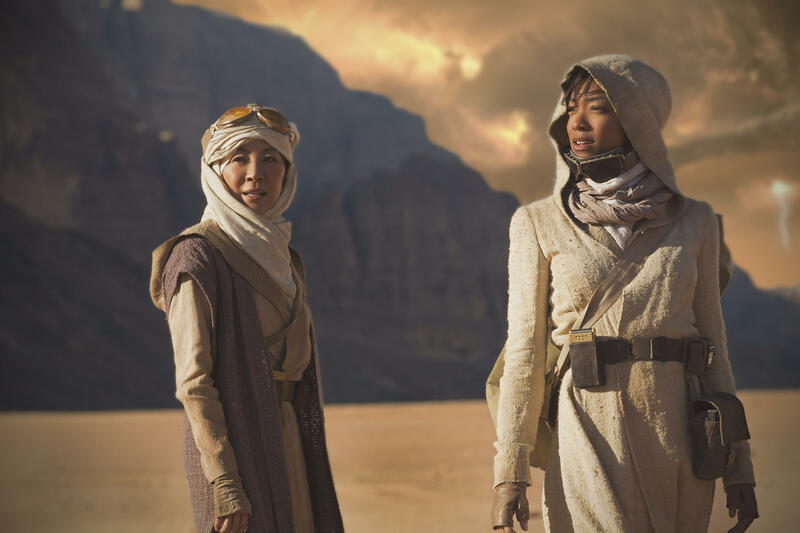 "Star Trek: Discovery" is out in less than two months, but fans can whet their appetites for the latest "Star Trek" adventure by checking out the covers of the new "Star Trek: Discovery" comic book and the novel "Star Trek: Discovery -- Desperate Hours." The "Star Trek: Discovery" comic book series is set for an October release from IDW Publishing, with "Star Trek: Discovery #1" out first. The comic book series will explore the backstories of key Klingon characters and ties into the TV series. The series is written by Kirsten Beyer and Mike Johnson with art by Tony Shasteen. Johnson has written several "Star Trek" comic books, including "Star Trek: The Official Motion Picture Adaptation" and "Star Trek: Ongoing." Shasteen also worked with Johnson recently on "Star Trek: Boldly Go." In addition to the comic books, the novel "Star Trek: Discovery -- Desperate Hours," written by David Mack, will hit bookshelves on Sept. 26. It explores the story behind Lieutenant Michael Burnham, a human woman raised among Vulcans, who becomes acting first officer on the USS Shenzhou. But Burnham must prove herself to Captain Philippa Georgiou and, with the Shenzhou, protect a Federation colony under attack by an ancient alien vessel. Burnham must infiltrate the alien vessel in order to save thousands of lives. "Star Trek: Discovery" is a prequel, taking place 10 years before the original 1966 "Star Trek" TV series. For the first time in the franchise's history, the main character will not be the captain of a ship, but instead a first officer, played by "The Walking Dead" star Sonequa Martin-Green. The show also stars Michelle Yeoh as Captain Han Bo, James Frain as the father of Mr. Spock, Anthony Rapp, Doug Jones and Rainn Wilson. The series will debut on Sept. 24 on CBS All Access.